Listening right now "La Isla (Bonita) by Madonna. Now you've got me hooked on that particular YouTube channel. I think I'm going to be spending several hours just looking through all of his uploads. Gawd only knows how many hours I'm going to be spending downloading and listening to it all. Damn you! but I see what you mean now! Duuuuuuuuuuude, I haven't listened to The Magnetic Fields in AGES. Good lookin' out homie. Saturday night and Sunday afternoon in order to get these 50 new tunes of his in. Almost boycotted it because of his distaste for "The Little White Duck". Relaxing the weekend away after my first week in my new career. 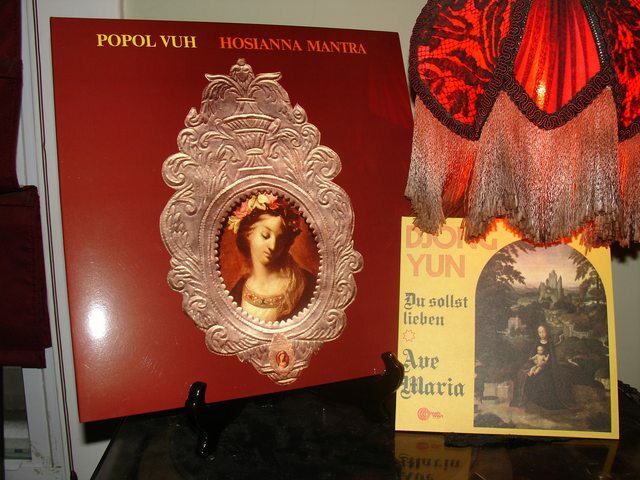 Tuned into the beautiful sounds of Popol Vuh's Hosianna Mantra. Nice album, nice video. Too bad he drank himself into a stupor. Moving on to a few key LPs of the nu jazz scene. I know the genre gets a terrible rap, being dismissed as bland, upscale urban cafe wallpaper, but it doesn't pretend to be anymore more, and I enjoy it for what it is. Presently spinning the Verve Remixed complete series box set. The opener is a very sultry minimal electronic rework of Billie Holiday's "Yesterdays". Full playlist on YT here. The track which initiated me into the scene was from vol 2 - Willie Bobo's Fried Neckbones and Some Homefries. My new boss dug the framed print I added to my desk today showcasing my favorite 20th century composers, and he asked if I'd seen this video. Definitely cooler than my last boss.